I LOVE creating beautiful spaces. Think of your favorite room in the house, or a space that you have felt safe in. What do you love about this space and why? The colour, the feeling, the smells? What elements of it would you re create in your birth room? The room I feel cosiest in in my house is my family room. I have put a lot of love into this room. It has a big soft sofa and rug, blankets that I have made, art I love. I painted it a soft relaxing pink (I really love pink) and have a little alter with some goddess statues. There are few things I love more than snuggling up with my family under the blankets, curtains drawn, scented candle and a good movie on the go! Or when I'm alone sitting on the deep rainbow rug in front of the window reading a book with a big mug of herbal tea, I tend to gravitate to this sunny warm room, this revelation of space I have created from the cold, hard ugly room it was before! I could definitely birth in my family room, I would feel so safe and cosy in the big soft sofa and would have so much space to dance and move my baby down if I needed to. 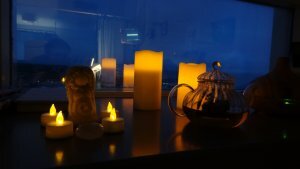 I also love to help create beautiful sacred feeling birthing rooms, because of course your birth is sacred and so is your birthing room, a feeling that can seem lost these days especially in a medical environment. The space should feel private, have soft lighting, a cosy warm nest for muma and her love to snuggle up in, affirmations and beautiful positive images hung and a great playlist filling the room. Very much a romantic love nest! This will create the right vibe for birth. When you think of a birth room what do you see? Most women I ask say a room with a bed in it, a typical hospital room. This is largely due to common images we see online, on tv and in moves which of course are mostly hospital rooms and women on hospital beds. Just because this is common to see it doesn't have to be YOUR experience and your space. The environment you birth in is very important and can have a great effect on the levels of fear and anxiety you feel. A vital ingredient to a positive and undisturbed birth is a feeling of warmth and safety, a space in which you can promote those magical hormones that allow your body to soften, open and release. The ideal birthing room for some is at home, this isn't always possible and sometimes not your choice. You can definitely create a beautiful feeling space in a hospital or birth center room and I have helped create many. I have noticed that people tend to enter the space and react softly and quietly when a room is set up to FEEL soft and calm, so that feeling of being observed is definitely lessened. You can even pop a sign on the door hotel style! You are absolutely allowed to move the room around in a hospital. Move the bed against the wall, just forget the bed for a while. Request a couple of birth mats, bring your own additions and have your birth partner and/or Doula set up the space with you or for you. 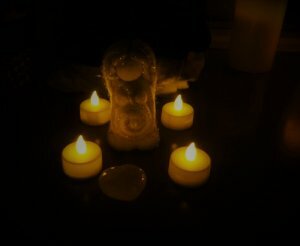 below are some ideas for things to bring to create your sacred birth space. All of these (bar the pillows and duvet of course)fit into my doula bag and I have never met a midwife who has any objections to the room changes, remember that you are an honoured guest not a patient. It can be really nice to add lovely things to your birth room bag throughout the pregnancy, create and add to your birth alter at home and meditate and practice yoga in front of it, then when you are going to the hospital or birth center take it with you in a bag or little case. One mother has kept her birth alter in a memory box along with some dried flowers from the birth room. This is a little felt goddess staue surrounded by led candles in a hospital birth room. I also had a lovely glass tea pot with me for herbal tea, just because it was pretty! The big hospital window sill made for a lovely display space. The room felt very cosy and was dimly lit. It also smelled amazing due to lovely smelling massage oil used. These are just some suggestions, your sacred birthing space will be personal so add your own elements and comforts. No matter how long you spend in your birthing room you will not regret building a beautiful and loving space to welcome your baby into.